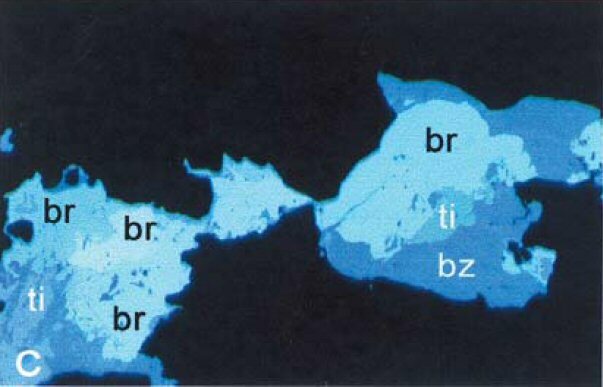 Comments: Polished section with partially crossed polarizers showing brodtkorbite (br) in association with tiemannite (ti) and berzelianite (bz). (CanMin, v40:225). Location: Telethermal selenide vein-type assemblage at the Tuminico Ia selenium deposit, Sierra de Cacho (Sierra de Umango) district, La Rioja, Argentina. Scale: Picture Size 0.5 x 0.35 mm.